A good title for a short story or novel is not always easy to come by. The writer wants them to sound just right. Most of my better short stories begin with a title. I come up with an idea and title I like, then they lead me down the path of the story. I don't create the title in a dead zone, without any thought of the story, but the two seem to come together about the same time. Sometimes, however, I have a story idea without a title. Then, once the story is complete, I try to come up with a title. This almost never works for me. I usually end up with weak titles this way. To help with this, I keep a list a possible story titles. Often I'll snag a line from a song or poetry or Shakespeare, and retool it slightly for my own ends. As an example, the title for my short story "Deep in the Land of the Ice and Snow" (coming out March 15 in the Flashing Swords anthology The Return of the Sword) in part came from a line in a song. Can you guess the song? And the band? If you can guess those two things I'll ... hmm, what will I do? Okay, I've got it! If you are the first person to guess which song and band gave me the idea for the title of "Deep in the Land of the Ice and Snow" I will use your name as a character in my next John Dee story. Of course I can't guarantee your namesake will survive such a story. And to go soft on you, I'll give one hint: Think classic rock. Come on. This is an easy one. Nowhere. I've been here all along, just busy. That's why I've not been posting much lately. My small business has kept me busy with a big project, and I've spent a little time goofing with my RadioDarkbow project. But what have I been doing with my writing? Well, I sent off about 20 packages to agents a week or so ago. Since then I've been researching other agents, and I've got a list of about another 30 I need to mail stuff to. Also, and more fun, I've been working on another John Dee story, "The Unconquered Man." I've also been working out what was wrong with the story, "Where the Baptized Drown," and I think I've got it worked out now so that I can straighten it out soon. Ingrid is a young, new artist, and since I like to promote new writers, why not musicians too? This is a nice song and a cute video. Enjoy. Recently I've been working lots of late nights. It's been busy work that I don't have to focus my mind on a lot, but it doesn't allow me to do something productive, like write. So, I've been putting together a little project just for fun. It's called RadioDarkbow. It's another blog, of sorts, but all that it will have on it will be music and music videos. I'm putting up two videos a day, and I'm trying to pick lots of different music for variety. But, of course, I'm only putting up music I like. Which means there will likely be a good bit of hard rock, classic rock and some metal, but I promise there will be plenty of other tunes for folks who don't care for that stuff. Check it out here. And remember, that's two new videos a day. Absolutely free. And no advertising. Notes: The author is a Vietnam vet and former CIA employee who was turned to writing novels, so this could be interesting. His specialty apparently is comical espionage thrillers set during and right after the Vietnam War. Mini review: Definitely a fun read. Not a laugh riot every page, but has on ongoing jocularity that flows throughout. A story in which you can never guess what's going to happen next. So, I liked it. My favorite version of this David Gray song, a fav by him. Aimee Mann is an artist I enjoy, and I'm posting this because I believe she's sadly unknown by many. One of my favorite Willie songs. Check out my full book review for "Inferno" at Apex Digest Online right here. Want to find out more about speculative fiction writer Bruce Durham? Check out an interview with him in Flashing Swords #9. And read his short story "The Night of the Meld" in Flashing Swords. 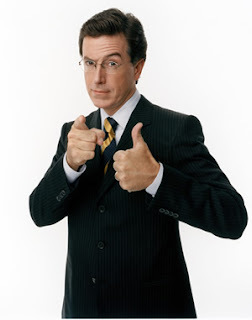 My wife recently told me she is in love with Stephen Colbert of The Colbert Report and the Colbert Nation. Colbert and I share the same middle name. We are both white, male Southerners. We both graduated from college with degrees in journalism. He and I have both worked at newspapers. We have both played Dungeons & Dragons and are big fans of role-playing games. Colbert, like myself, is a huge fan of fantasy and science fiction. These coincidences are just too unlikely. Now I understand why my other half loves this man. Who am I to deprive her of her fantasy? I've now lost 105 pounds. I walk at least a mile about every other day, sometimes more than a mile. I can now eat about what I want as long as I don't eat too much bad stuff on a regular basis and don't eat too much of it. My breathing is good again, only growing a little shallow after I've walked a lot or climbed a bunch of stairs. So, I'm back on track. I even had a beer a few days ago. So, I'm off the Internet at home for about two weeks. I finally get everything working again, and what happens? The storms that slammed Arkansas and Tenn. also roared through our area. And our power was out for nearly two days. Sometimes you've got to wonder if you're not living in a diabolical version of The Truman Show. And lest you think I'm uncultured, here's the ending to my favorite opera. This scene also happens to open my John Dee story, "Interlude in Lombardy," with the clown's final words. Because I couldn't do just one. A cheesy movie, a cheesy song. But hey, it rocks and the movie had swords. Okay, this is really just a way for me to keep track of John Dee stories I've written or am working on. I'm posting this here because it will be on the Net, thus available to me when away from home, and I'm posting it publicly so I don't have to sign on to blogger.com unless I want to. The years listed are when the stories take place. It was about my John Dee short stories. I've got five completed right now, and three of them out in circulation. I put dates and places at the beginning of each story. Usually something fairly generic like "Small town in Texas, 1881" or "New York City, 2001." Mostly I don't mind if an editor doesn't want to use that information, but sometimes it could be helpful, pointing out story specifics without me having to get into it as much in the actual story. Sometimes the places and dates are important; sometimes not so much. But even if an editor doesn't use those dates and places, I put them at the top of each story (just below the title and my name) for my own purposes. It helps me to keep track of when and where John is. John has lived an extremely long life, at least by mortal standards. So, he's been around a while. I know the basic outline of his long life, where he started and where he has traveled to during certain broad periods of time. He's not as well traveled as one might think, at least not until the modern age, but that's more of a quirk of his sometimes varying personality than it is anything else. But back to my dream. Or maybe it was a nightmare. I dreamed that I had written one short story for each year of John's life. Sigh. I won't go into how many years that is, but I did some figuring. I guessed at the average length in words each story would be, then multiplied that by John's age in the year 2008. I figured I'd have to write about 6 million words. Something like 60 books. I don't talk much here about television, but I feel this is related to writing. At the end of the last season of Lost, I swore off the show and cursed the writers, producers, directors, actors, everybody who had anything to do with the product. I was pissed. Big time. I felt three years was long enough. It was time they started giving me some real clues about all the mystery behind the show. But did that happen? No, it did not. The third season ended with nothing answered, and I was frustrated because nothing much seemed to happen each episode; there'd be one little hint about something, but nothing concrete, and another twenty mysteries to add to the never-ending pile of mysteries that keeps growing and growing. I swore I'd never watch the show again. Then this week I came home from work late one night and my other half told me she had recorded the show and I really needed to watch it. So, without the Internet to distract me and on the recommendation of my significant other, I watched the show. This is where I'll start weeping. Damn those Lost writers. Damn them. They've got me hooked again. I wrote and sent off my latest book review. I kept my short stories in circulation. 16 of them are out and about right now, with a few editors nibbling but not biting just yet. I did some rewriting and editing on three John Dee flash stories. And most importantly, I kept writing. I've been working on yet another John Dee story, this one another modern tale. Also, I worked on a proposal project on my trilogy. I've put together a package I'm planning to send out to 20 literary agents. 20 might not be a lot, but I've already hit up about a dozen. I put this package together because I wanted to try something a little different than just shipping off another e-mail with a sample of my writing. I wanted to stand out, but not goofy, to remain professional. I've got the 20 packages together now and am planning to snail mail them next week. That's right. My Internet connection at home has been fixed. Turns out it was a modem problem. And I now hate the company that provides my connection. So blah!